We do not know how the decisions made at the General Conference in St. Louis will affect our ministry in the long term. What we do know is that God's call to serve with all people has not ceased. Mission teams will continue to work to build God's Kingdom, regardless of their views on the decisions made. Christian service is a powerful thing. It shows us God in a new way--in different faces, cultures, and even theologies. We hope that United Methodists remember all the good we have done together. 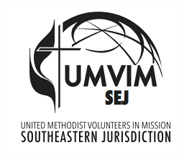 UMVIM is here as long as Methodists want to serve with one another. Our work of resourcing mission teams through training, insurance, and prayer will continue.